2018 was a record year for renewable energy generation, but the lack of distribution infrastructure to get it onto the grid has led to a situation where falling electricity prices have not materialised. The Australian Energy Market Operator and Australian Energy Market Commission have warned that a mismatch is being created, which will lead to generated energy going to waste. Both said Australia must take action now to ensure that the renewables boom translates into cheaper energy. A Clean Energy Council report confirmed 2018 as a “remarkable” year for renewable energy in Australia. But there are increasing concerns that there is simply not enough distribution infrastructure to ensure that the new power being generated makes it into the grid. More than 2.3 GW of new renewable energy capacity entered the market in 2018 as 38 large scale projects were completed throughout the year. At the end of 2018, 14.8 GW of new generation was under construction or financially committed, which was a 260 percent increase on 2017’s 5.6GW. This $24.5 billion investment created more than 13,000 jobs. In the small-scale solar market, rooftop solar installation notched up 45 growth in the commercial market and 43 percent in the residential sector, to reach a combined total of 1.55GW installed in 2018. In large-scale solar, an average of more than two big solar farms (5MW and over) was commissioned each month in 2018, adding a total of 1442MW of new capacity. A total of 87 projects were under construction or financially committed at the end of 2018. Wind also had a good year, the report says, with nine new wind farms commissioned, including the 270MW Sapphire Wind Farm in NSW. Another 24 wind farms, with a combined capacity of 5.69 GW, were under construction or financially committed at the end of 2018. 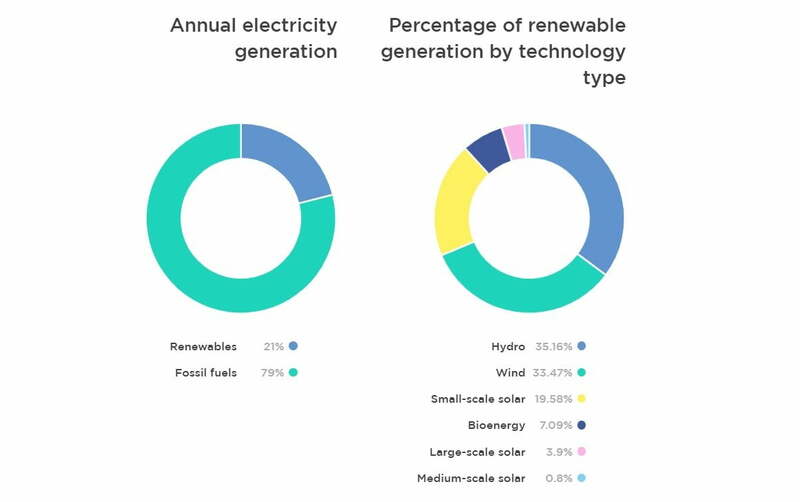 In 2018, the percentage of renewable energy passed 20 percent for the first time, with clean energy contributing 21.3 percent of Australia’s total electricity generation. 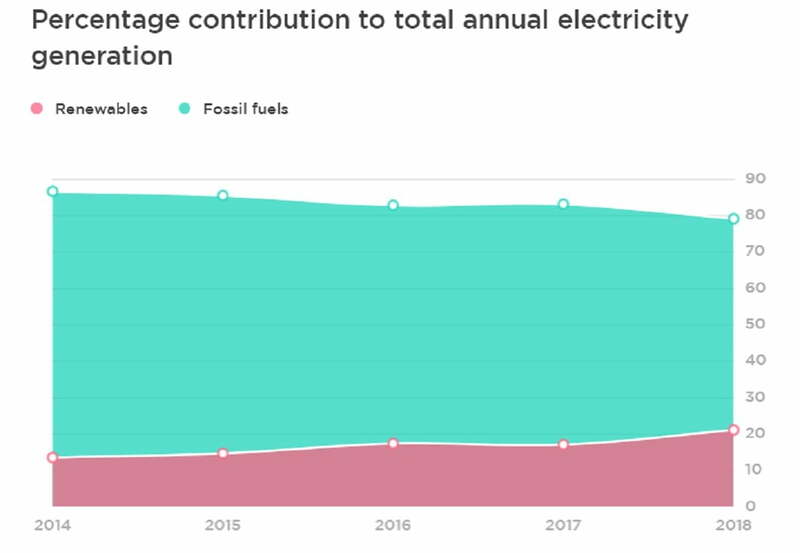 This was a significant increase compared to 2017, when renewables were responsible for 17 percent of total electricity generation. Hydro generation was again Australia’s renewable energy leader, accounting for 7.5 percent of Australia’s total national electricity generation in 2018. However, wind was close behind, contributing 7.1 percent of total electricity generation throughout the year. The large number of new renewables means many are either unable to connect to the grid due to the sudden congestion from excess power being generated at the same time or just a complete lack of transmission to push the power into the grid. The Australian Energy Market Operator has already warned of a mismatch between the levels of renewables and a grid that is unprepared for them. Another problem is that Australia’s distribution infrastructure is geared towards fossil fuels. Thermal power plants were traditionally sited close to the mines where coal was produced, meaning that the substations and other necessary transmission equipment was sited close to them. Wind and solar farms are sited much more haphazardly, meaning that sometimes, there is no connection and one has to be purposely built. Wind farms in western Victoria and south-eastern Queensland and solar farms in western NSW are particularly at risk. One potential project, the $8 billion, 2000 megawatt Star of the South offshore wind farm off Victoria’s coast – which could provide more power than the closed Hazelwood coal-fired power station – has no way to provide power to the grid yet is still rolling ahead. Without adequate capacity on the transmission network, generators connecting to this part of the network will need to be heavily constrained to maintain power flows within safe limits, which could impact electricity prices over the long term. This means it would simply disconnect wind and solar from the system, wasting power. Want to find out if your business can harness solar power?